Onsa's Olive Oil for sale. Buy online at Zingerman's Mail Order. Gourmet Gifts. Food Gifts. With love (and flavor) from Tunisia. We’ve been selling oil from Majid Mahjoub—our source for couscous, harissa, and a slew of outstanding foods from Tunisia—for a few years now. 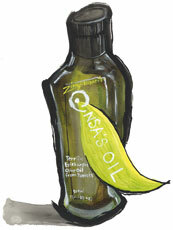 But brand new to our shelves is Onsa’s extra virgin olive oil, named for Majid’s wife Onsa. It’s made from unique-to-Tunisia chetoui olives. In a small section of Majid’s organic orchard, the olives are allowed to remain on the tree a bit longer before harvesting. Harvesting the olives when they’re more mature lends a softer, sweeter quality to the oil, though it’s still got a healthy, bitter, peppery kick. The latest harvest, picked and pressed at the very end of the season in January 2019, has an aroma that reminds me of an herb garden: earthy, with hints of parsley or rosemary. The flavor is earthy as well, with a gentle grassy bitterness. The mouthfeel is quite light, and the finish brings a healthy kick of pepper.